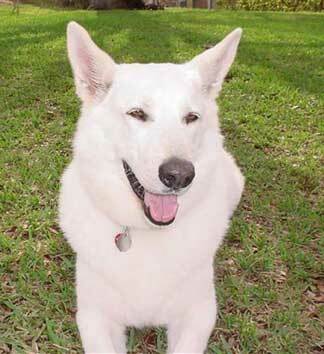 Here is the story of white GSD Bailey - a rescued German Shepherd, sent in by J. and H. Bass. I hope you all enjoy reading it. My name is Bailey and I will be 11 years old on February 21, 2009. 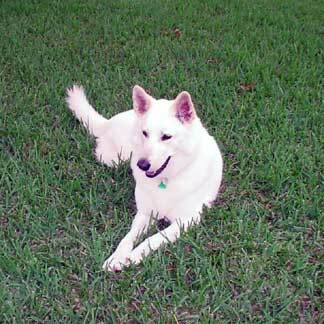 I am a White German Shepherd male. The first 5 years of my life was with another family who gave me up to the Humane Society for adoption. I don't know why since I am very well mannered and a very sweet dog. My story begins here. My forever Mom & Dad came in after I was here for two days and they fell in love with me. I took a little longer since I was depressed, but I soon realized that this was the best thing that ever happened to me. I love them very much now and will always be by their side. I have been with my forever family for 6 years. During the first year with my new family, I developed a skin condition know as Sebaceous Adenitis, which unfortunately will be with me for the rest of my life. To keep me healthy, this includes frequent anti-seborrhea shampoos, baby oil treatments for my skin and proper diet. My Mom gives me a bath once a week, and my skin condition is under control. In January, 2006, I had to have a gall bladder operation. My Mom and Dad saw I was not feeling very well and took me to the hospital. After a few tests, I needed the operation. Thank goodness I came through very well with the help of my family and doctors. I am fully recovered now and can eat anything, within reason. I am sending you two pictures of me and you can see that I am very Happy. My Mom and Dad say that I am a gift from Heaven. I realize they have a lot of friends, I only have one, them. I depend upon them for my life and they are doing a good job keeping me alive. To them, I owe my life, and I will lay down my life for them.